Availability By credit card, debit card or PayPal at the Bowling Legends website; or by sending a cheque or postal order for £17.39 to Alan Ward, 203 Blackpool Old Road, Poulton-Le-Fylde, Lancashire FY6 7RS. The book is not available through retail outlets or online booksellers. Synopsis Books on crown green bowls are few and far between and to the best of my knowledge this is the first one to be published for about six years - apart from the annual BCGBA Handbook of course. Bowling Legends is a profusely illustrated, fact-packed magnum opus of 420 pages that involved the author in three years of extensive research and writing. As such it is almost certainly the lengthiest book ever written on the crown green game and is a notable addition to the small number of existing publications. 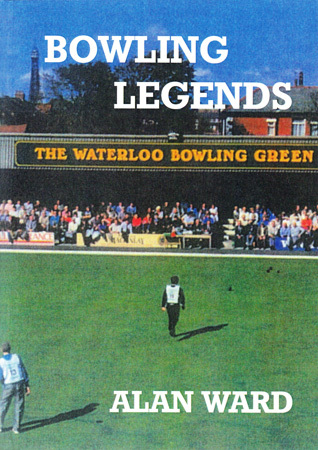 It tells the story of crown green bowls from the 1870s to the present day and puts on record the names and achievements of bowlers - both men and women - who are legends in the game. It explores the history of the Waterloo and Talbot bowling tournaments and includes the details, drama and excitement of the final day's play in both competitions as well as other top events such as the Bass Masters, the Greenalls County Classic and Champion of Champions. Bowling Legends is guaranteed to be of significant appeal and interest to all bowlers and spectators, and you can see Alan being interviewed about the book here.